Reference number for this case: 3-Oct-54-Montgenèvre. Thank you for including this reference number in any correspondence with me regarding this case. In La Rochelle, M. and Mrs. Guillemoteau were in front of their farm when they saw within one meter approximately from the ground, a spherical saucer that might have measured 2 to 3 meters in height and a diameter of 5 meters. The machine which did not produce any noise stopped a few minutes, then went up vertically. Mr. Guillemoteau, the next day, went to the place where she had seen the machine and affirms she noted oily traces on the grass. MONTGENEVRE (C.P.). -- Many people were able to follow Sunday from 09:30 a.m. to 6 p.m. the moves of a "flying cigar". Observed with the binocular the machine which seemed to station at a very high altitude, disappeared finally behind the ridge of Montbrisson, after nine hours of flight. The "Martian" of the Finistère had the face covered of hair and the eyes like "a corbel's egg"
QUIMPER. -- Around 4 o'clock, Tuesday morning, Mr. Pierre Lucas, bakery worker in Loctudy (the Finistère) who was busy drawing water in the court of the bakery, suddenly saw in the night a machine in the shape of a saucer of 2 m. 50 to 3 meters in diameter. He saw come out of it an individual measuring approximately 1 m. 20 who approached him while articulating unintelligibles words. The bakery workman managed to stay calm and returned to the bakehouse where the unknown followed him. In the light Mr. Lucas managed to check out the face of the visitor. He had the face covered of hair and the eyes of the size of a corbel's egg. The young man called his owner but, before the latter had enough time to come down, the nocturnal unknown had disappeared as did his saucer, no trace of which was found. A beer merchant of Concarneau had, on his side, stated to have seen in the sky, two luminous discs of the form of round tables prolonged of a kind of tail. One of the discs was motionless while the other moved in the vicinity. The two discs disappeared at the end of ten minutes after having launched a rocket. MANTOVA. -- The traffic was stopped during more than one hour in the center of Mantova by groups of people gathered to observe a strange "white object" which, at a high height, was clearly detached on the background of the blue sky. After having carried out extremely fast maneuvers, the machine, of spherical form - and which according to certain witnesses formed part "of a formation of flying saucers" remained motionless for some time in the sky, before disappearing at the horizon. In addition, the "Martians" also seem to want to visit Italy. Indeed, a fisherman of Roverbella, province of Mantova, stated to have been approached by a "mysterious individual", dressed in red, which would have spoken "unintelligibles words" to him, and which would have quickly moved away before the fisherman had the time to call his wife. DID A SAUCER LAND CLOSE TO BARCELONNETTE? BARCELONNETTE (C.P.). -- During the day of Tuesday, four people residing in Barcelonnette, extremely known and esteemed in the city, saw at 11:15, a mysterious metallic object, which was shining in the sun, in the area ranging between the higher part of the forest of Gaudissart and below the Chapeau de Gendarme. This machine, very odd, disappeared later, during the afternoon, as mysteriously as it had come. The authors say that following day morning, the object seen in Avignon on October 2, 1954, reappeared above the Briançonnais, still accompanying the Moon. At the beginning of the afternoon, it was found in the same place in the sky as the day before. One of the witnesses calculated that it "crossed 450 kilometers in three hours, that is to say a complete circle in twenty-four hours." The object disappeared in the evening of October 3, 1954, behind the Montbrison mountain range, and the following day the sky was empty. "One tends so much to ridicule people who claim to have seen flying saucers or cigars, that very often, the involuntary observers remain silent and reveal their observations only with a little delay. It is the case of several people who saw at Mont Genèvre, Sunday October 3, during almost all the day, the trajectory of a machine which they relate to, given its elongated shape, a flying cigar. The first observation was made by Mr. Roux, gendarme, who was on the slopes of the Chaberton, at 09:30, in the morning. He could very distinctly see the shape of the machine which seemed motionless above his head, at a very high altitude. He followed it during a few moments and alerted six other people who, from Mont Genèvre, could very clearly observe with the naked eye the same machine. For more safety, they were provided with binoculars and continued their observation. The machine moved in the south-western North-East direction and crossed very slowly the sky of Briançon since it crossed the space ranging between the mountains, between 09:30 a.m. and 06:00 p.m., time when it disappeared behind the chain of Montbrison (Les Tenailles)." "To the unaided eye, in the end of the afternoon, it appeared as a ball of fire. But to the binocular one could extremely well distinguish his elongated and luminous shape; it moved without noise. All the witnesses are unanimous to state that the machine appeared very heavy and that it could not have been a matter of optical phenomenon, nor a balloon..."
"The observations having been made during several hours and by people all different and worthy of faith, namely: Messrs Paulin Balat, deputy mayor, Roux, gendarme, Falconnet, hotel manager, Lucien Moulet, Daubarre, Henry Rignon and Jugy, all were, you can guess, amazed by their disconcerting observation." The authors comment on that it was a balloon and that the witnesses never said anything different. They add that a balloon is roughly spherical, that it becomes red in the setting sun, and they joke around saying that when a balloon "starts at a supersonic speed, it is that it is violently pulled by a journalistic gust: one say that it is "pressé"! " ("pressé" meand rushed and resembles "Press"). A gendarme being on the slopes of Chaberton first observes an object high in the sky seemingly motionless. It seemed to be a cigar. At the end of one moment the object seeming to remain in its place, the first witness alerts 6 other people who observe it in their turn. The object remained in the sky advancing at the same pace than the moon and always remaining at the same distance from the latter going from the North east towards the South west. It disappeared after 6 p.m. behind the moutains range of Montbrison. Not looked for yet. Reflection of the moon on an icy cloud layer partly possible, balloon possible. 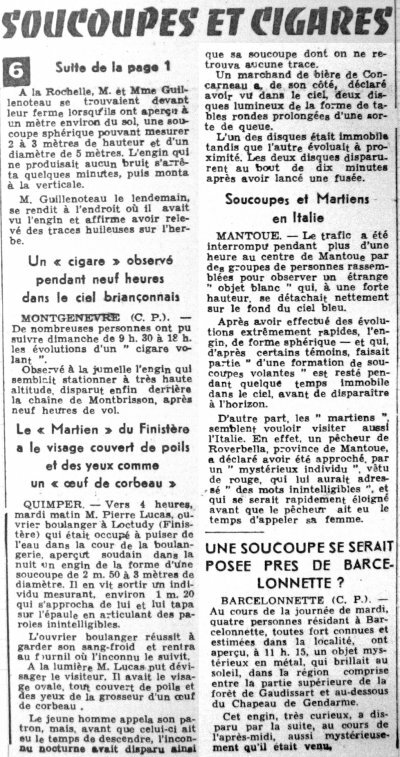 [---] Article in the regional newspaper Le Dauphiné Libéré, October 5, 1954. [bb1] "La Grande Peur Martienne", book by Gerard Barthel and Jacques Brucker, Les Nouvelles Editions Rationalistes publishers, pp 155-156, 1979. 1.2 Patrick Gross October 26, 2011 Addition [gl1]. 1.3 Patrick Gross February 12, 2017 Addition [ub1].